Just as exciting as the dresses and makeup seen during Bridal Fashion Week is the hairstyles. What the top designers in the fashion industry are choosing to do for bridal hair always sets the stage for every bride in the world for the year. Here are some of our favorite bridal hairstyles for 2019, straight from the runways. 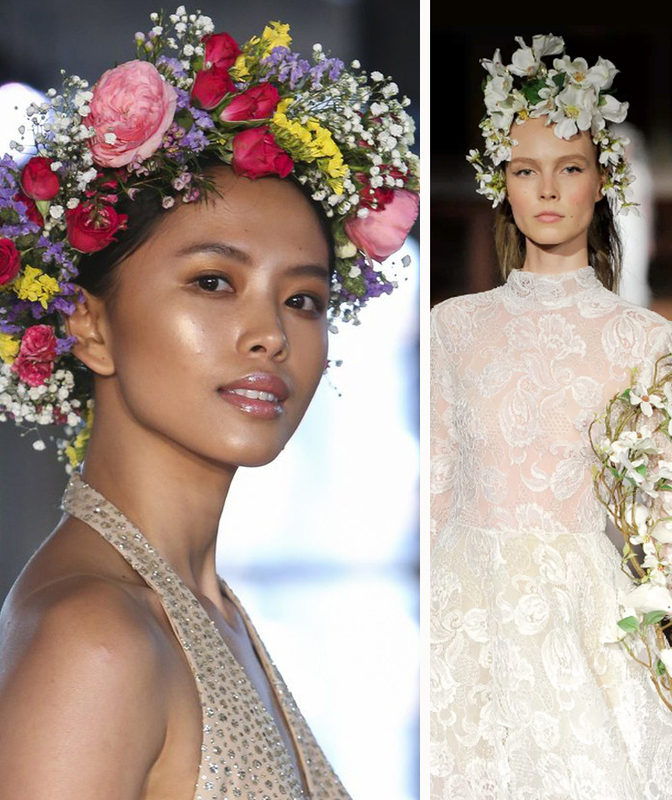 Brides have been wearing flowers in their hair ever since, well, there have been brides. However, runways this season saw a different take on traditional hair florals. Rather than the typical flower hair combs that we have come to associate with brides, 2019 will be brimming with carefully-placed flowers which sprinkle the hair. This look is quite sweet and just a little bit hippie, and works beautifully with hair worn down and natural. Bows have been absolutely everywhere on the runways for 2019. From the bejeweled bows of Reem Acra to the giant bows in Watters’ models hair to the oversized bows incorporated into designs from Carolina Herrera and Viktor & Rolf, respectively, there was no shortage of knots. But the most buzzed-about bows have been Lela Rose’s feminine, flowing ribbon bows which held up sleek ponytails and elegant buns. 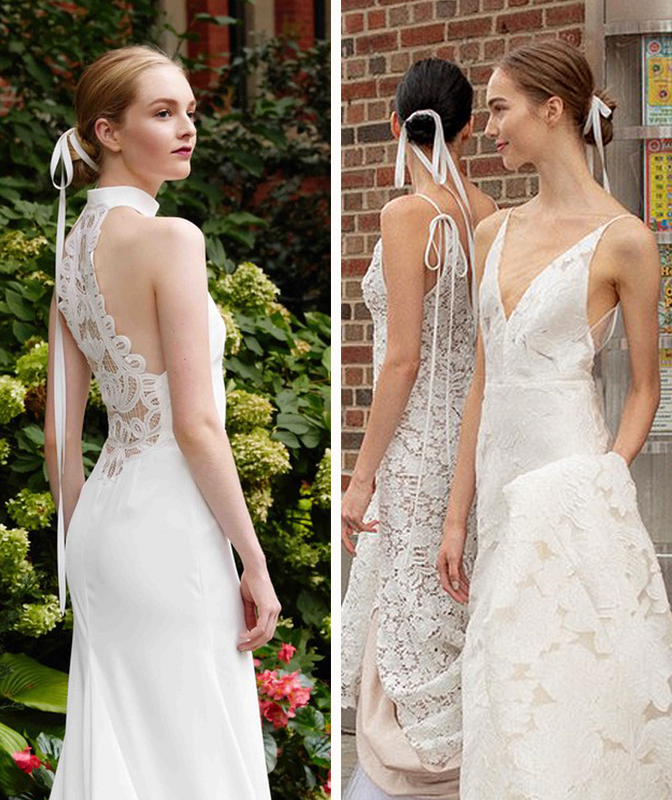 The length of these bows (about five feet) adds to the sheer chicness of the overall bridal look. This trend is thanks to the Duchess of Sussex herself, Meghan Markle. Her reception tendrils won the hearts of many, and bridal beauty was instantly born. Of course, tendrils popped up all over the runway, along with many other Markle inspirations. Engaged ladies are thrilled to experiment with tendrils, which were huge in the late 1990s. This style is versatile: it can be dressed very up, or very down. Meghan chose the latter. Nearly all of Reem Acra’s bridal runway designs for spring 2019 featured floral-topped models, a visually dazzling concept that had everyone talking, as did Alejandro Resta designs at Barcelona Bridal Week. Similar to Coachella flower crowns yet much more bridal, hair bouquets are only becoming more elegant. For fashion-forward brides only, this look is both striking and sweet. Half-up hairstyles are a long-standing bridal staple, but typically they are paired with voluminous curls, flowers, or a veil. 2019’s trend for the classic half-up hairstyle is to strip it down to simplicity. Many half-up hairstyles have been left alone, with no accessories at all—and even those that did incorporate a little glitz were still very minimal, like the pearls seen above. This style is elegant and very chic, and allows more attention to be focused onto the dress and jewels. 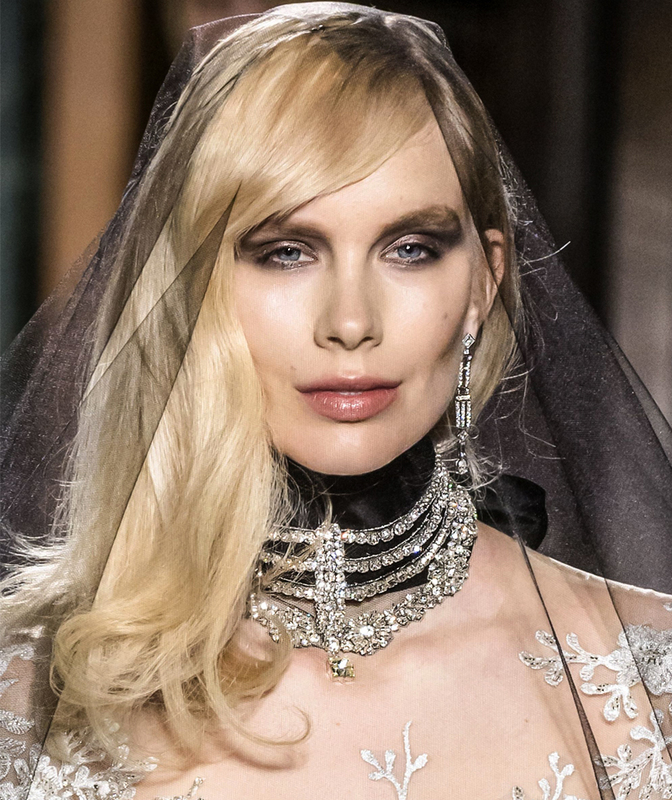 Worn in the absence of a veil, white hairbands have been all over the place in 2019 bridal fashion shows. 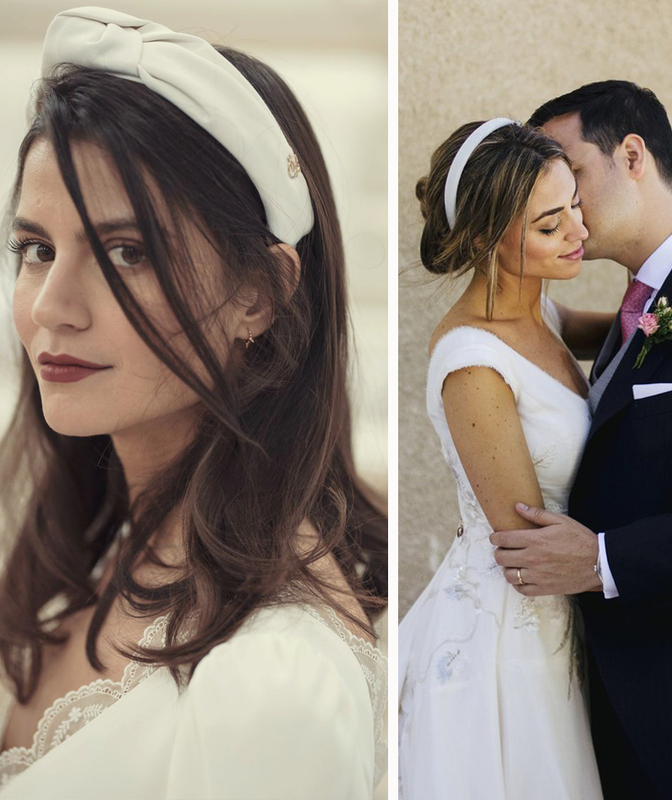 These classic accessories are simple yet extraordinarily girlish and sweet—making the ideal bridal hair accessory for both no-fuss brides and those who have complex hairstyles. 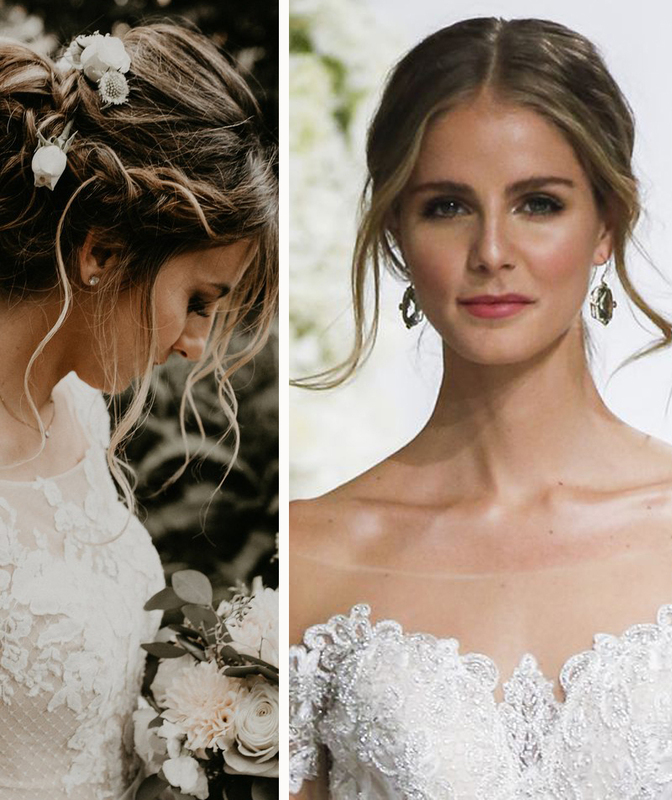 We are absolutely in love with the ultra-feminine, low-fuss hairstyles that were trending at Bridal Fashion Week Spring 2018 this month. The entire feel of the season’s designs reflect romance, tradition, and femininity, and the hairstyles on the runway went beautifully hand-in-hand with this concept. While the obvious trend for 2018 is keeping it long and flowing, there are a few standout updos. These wedding hairstyles are gorgeous, and they each have the ability to never look dated—so if you decide on one of them for your own ceremony, you certainly won’t need to be concerned about having regrettable hair in your wedding album several years from now. Here are the most stunning wedding hairstyles and hair accessories from Bridal Fashion Week Spring 2018. If you’re looking for a wedding hairstyle that allows you to keep your hair down while still looking elegant, try these Hollywood-inspired side swept waves. 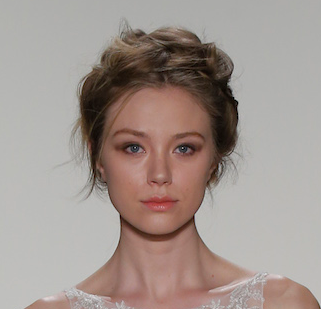 Timeless and flattering, this look pairs particularly well with a gauzy veil, as we saw on the runway Reem Acra. Romantic and youthfully chic, this ponytail gives the impression of demure purity. For an extra lovely touch, tie up your pony with a sweet ribbon, as we saw from Marchesa and Oscar de la Renta. One that is old, new, borrowed, or blue, perhaps? 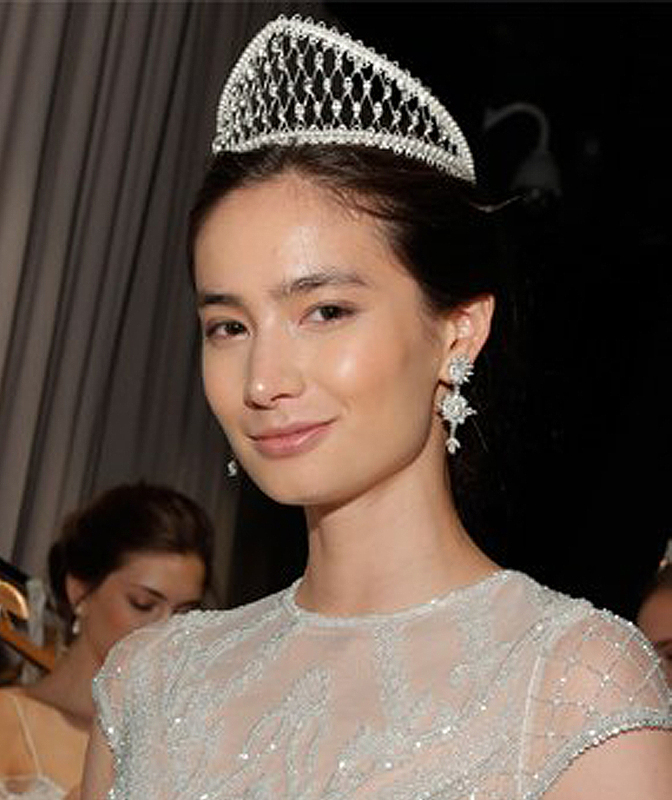 Tiaras are jewelry for your hair, and Bridal Fashion Week did not disappoint in this area. 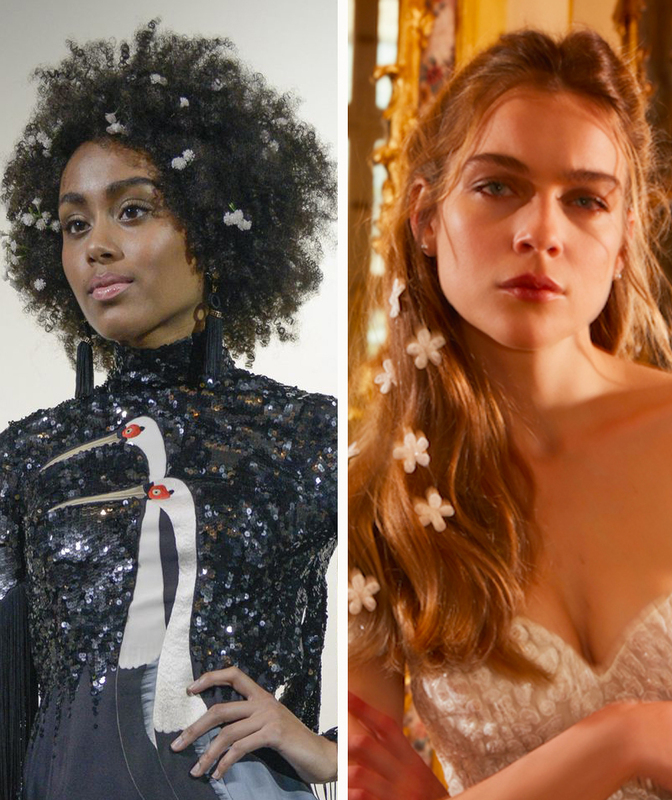 Rime Arodaky, Naeem Khan, and Alon Livné all showcased stunning, otherworldly tiaras this year. If you want to look like a princess for your ceremony, consider a hair accessory like this to highlight your bridal look. Besides beautiful low ponytails, Marchesa also gave us this pretty style. 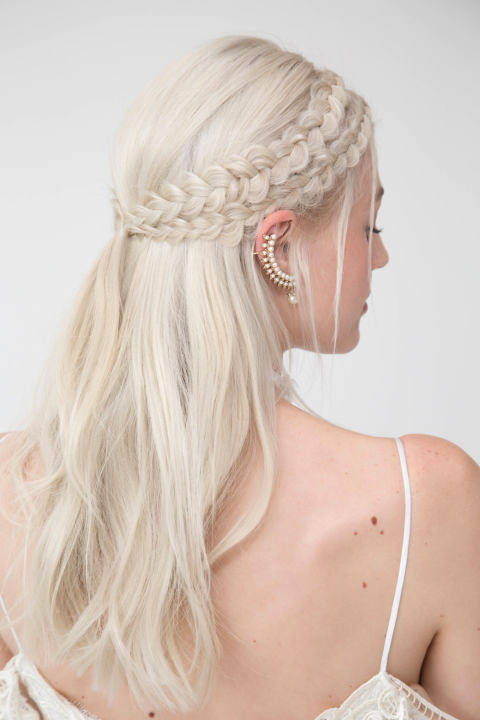 Delicate and easy, this look frames the face with soft parallel Dutch braids which crown a classic half up. 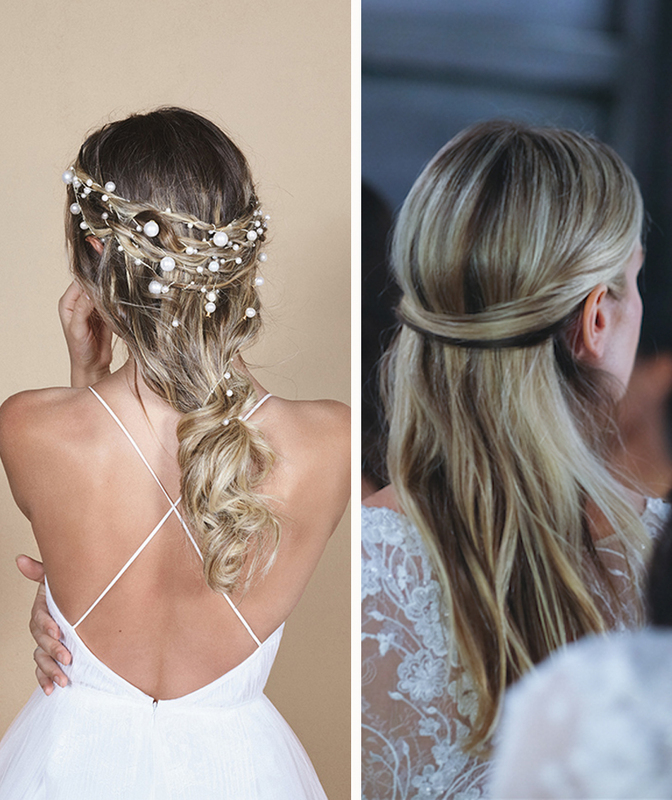 Very fairytale, very sweet: the ideal wedding hair to go with a romantic gown. Release your inner Kardashian with this long, silky style that never fails to emote the height of fashion. Not only sophisticated, this style also requires little maintenance and creates easy, no-fuss bridal hair. Presented beautifully by Sachin & Babi, this style also shows off statement earrings that were also spotted all over the runways this year. We’re completely smitten with this year’s entire collection from Lela Rose, but her vintage-inspired wedding veils stole the show. Echoing the unforgettable glamour of the 1940s and 1950s, these birdcage veils capture the grace and style that every bride should radiate. Jenny Packham’s sensational collection was enhanced by her models keeping their hair loose-flowing and natural. While many brides may want impeccable hair on their wedding day, those with a more laid-back style might prefer free-spirited mermaid hair. It’s just as romantic, and has the advantage of being extremely low-key to manage. Of course, the classic wedding style of hair swept away from the face will always be a bridal favorite. This year, instead of the same old dull styles that tend to bring the prom to mind, or the too-wet look of the past, we saw effortless-looking updos on the runway from Kelly Faetanini. Each style was bohemian-soft, yet extremely chic. Your wedding hairstyle will require the perfect high-profile wedding venue so that the ambience around you will match your beauty. Take a look a look at our gallery to see one of the most extravagant and enchanting wedding venues in Los Angeles, De Luxe Banquet Hall. Or if you have any questions for our team of wedding experts, feel free to contact us. We would love to hear from you!